About: Théo’s background is in graphic design, but he chose to study visual communication after his baccalaureate. During this period he met the artists collective 9ème concept (9th concept), whose ambition is to exhibit different projects every day. In 2008 he starts to work with the collective and finally realizes that it’s possible to live from drawing and to do commissioned work that has no set style or guidelines to follow. Théo has been drawing since he was a little kid. A big fan of cartoons, he used to spend hours watching Teenage Mutant Ninja Turtles. Very early he painted his first mural and arriving at the 9eme concept, he had the opportunity to collaborate with some of his idols. His style has been evolving a lot since then. He is always experimenting on his art works, which are striking, fresh and extremely elaborate at the same time. Basically his mood and the environment are the elements that impact directly his works. One of the principal characteristics of his universe is “the line”. He works and models this line to create abstract forms or characters, masks, monsters, or rhythmic games. His inspirations are quite tribal and ethnic, intending to give birth to spirits and to materialize emotions, play with fate and interpret the unknown. The characters and elements which reoccur in his artworks are spirits, souls, and emotions that he depicts with lines. He loads up on varying images, whether they are visual, sonorous or color-based. Sometimes it happens that the inspiration comes from his dreams, but most of all it appears in front of the white paper. Théo works quite a lot on performance, on ephemeral work, on improvisation, on mural fresco, and many other indoor projects. In 2014 he has participated in the event “de l’art à l’Ourcq” organized by Art Azoï collaborating with with Lapin Thur and Olivia de Bona. Where you can see it: Paris, Lille, Marseille, Bordeaux, Moscow, Lisbon, Tel Aviv, and more. 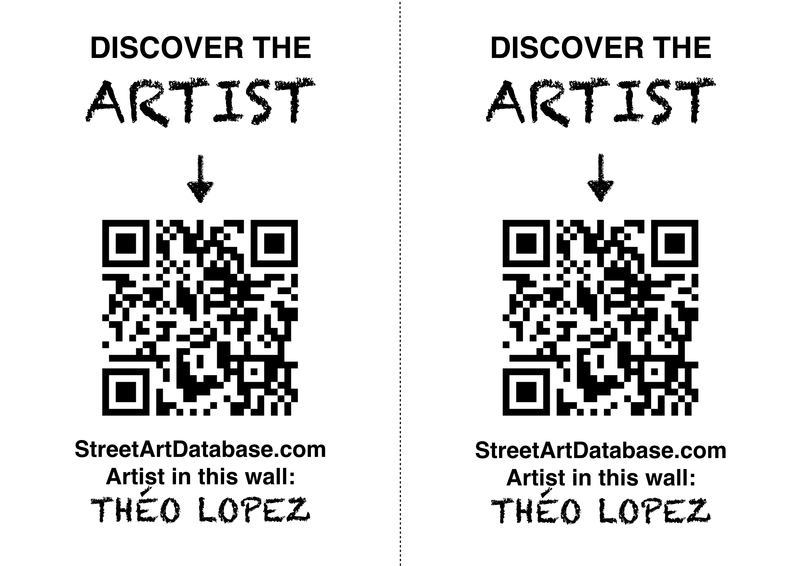 PRINT CODE: help tagging Théo Lopez in the streets of your city! Posted in graffiti, murals, stencilBookmark the permalink.